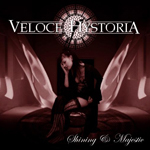 Fans of progressive metal need to discover France's Veloce Hystoria and get their premier release 'Shining & Majestic.' This young and very talented band creates a rich and compelling tapestry of progressive metal which often uses a power metal foundation, yet also explores some very interesting neo-classical elements. Essentially, however, Veloce Hystoria has the fundamentals in place: exceptional and versatile use of all instruments with melodic and technical arrangements. Most times, these two components work well together. After the prelude, your first introduction to Veloce Hystoria's skill and creativity comes on 'Childlike God,' a prog piece with a power metal pace. This song foreshadows a tandem use of guitar and keyboard which permeates the entire work; equal to this first song is the later 'Thoughts In The Garden.' Veloce Hystoria is not above allowing the power metal motif to take the forefront. On 'Memory Of Insane,' it drives the arrangement furiously from beginning to end while still tripping you up with some excellent melodic metal and a traditional guitar solo in the middle. The closer 'Shining & Majestic' does much the same, yet the tempos vary, the keyboards and vocal arrangements lighten it, and the guitar work is mostly neo-classical. However, the richest tracks are those where the progressive metal rises higher. 'Written Among The Symbolic' is defined both the incredible rhythm section where the drumming stars and the epic guitar work. 'Chronology' is a song that is heavy and strong, but the keyboard presence is majestic and the guitar work turns to traditional metal. The premier piece on 'Shining & Majestic' is 'Out Of Mind,' a splendid and true work of progressive metal that indulges all instrumental and compositional elements. About three and a half minutes into the song, a compelling piano/keyboard segue leads to a vibrant and lively guitar solo. Another equally impressive piece akin to 'Out Of Mind' is 'Damnation' which has a monumental classical/metal movement about seven minutes in leading to even more impressive neo-classical guitar work. This song could have been the premier cut on the album if it were not for the several doses of death growls within. This observations leads to the downside for me on this whole work. I was not terribly impressed by the performance of ex-Platitude vocalist Erik EZ. Certainly, he was steady and proficient enough, yet his raw and muddled tonal quality did not seem to fit the music. Veloce Hystoria's 'Shining & Majestic' was a complete and enjoyable surprise for me. The creativity, precision and depth of their brand of progressive metal was quite remarkable for a young new band on their debut work, an exceptional accomplishment. Very recommended! Veloce Hystoria's 'Shining & Majestic' was a complete and enjoyable surprise for me. The creativity, precision and depth of their brand of progressive metal was quite remarkable for a young new band on their debut work, an exceptional accomplishment.